The Albany Board of Zoning Appeals granted an area variance for the height of the project at its meeting the evening before Thanksgiving. 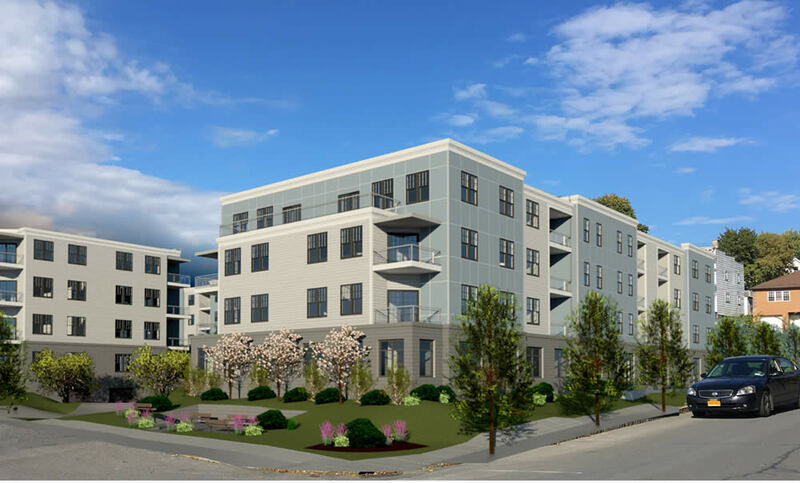 That variance will allow the 109-unit apartment project to be four stories tall if it ultimately gets approval from the city planning board and moves forward. + Demolishing the Playdium bowling alley building at 363 Ontario St.
+ Building three new residential buildings with a total of 109 apartments. + The Ontario St-facing building would also include a cafe/shop on the first floor with a laundromat. + Roughly 150 parking spaces. The three buildings would include parking underneath, and the site would also have some outdoor parking. + Rents ranging from $1,250 for a 1BR apartment up to $1,600 for a 2BR. So what was important about this decision? In the big makeover of the city's zoning code that took effect this past summer, The Playdium site is zoned "Mixed-Use, Neighborhood Center" -- a designation that allows buildings to be 3.5 stories tall. 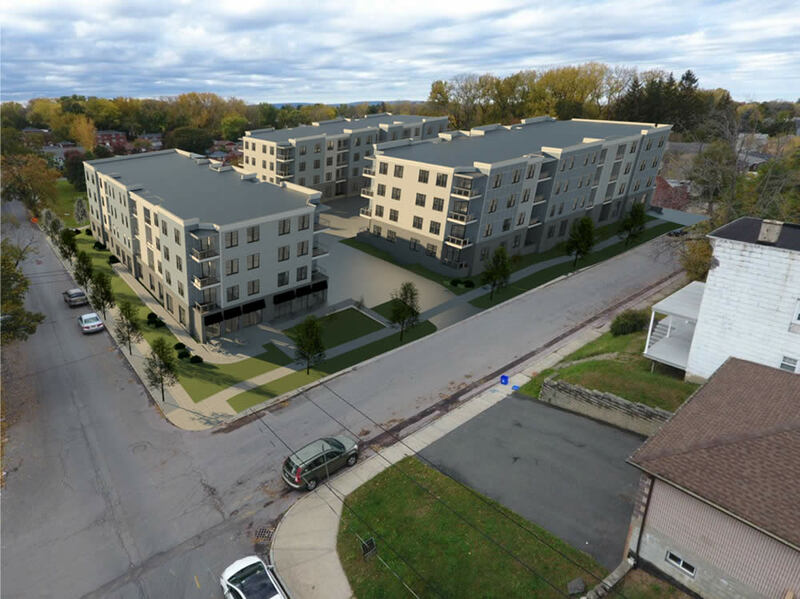 The Jankow Companies -- the developer for the project -- originally proposed that three new apartment buildings on the site be 3.5 stories, with the top half story incorporated into a mansard-style roof. The look of that version didn't seem to go over well. The roof design was criticized for not really fitting the neighborhood. (It also just kind of looked odd at that size.). So the development team reworked the design with a flat roof -- and four stories. And that required the variance. That four-story design actually ends up being about five feet shorter than the original 3.5-story design because of the shape of the roof(s). 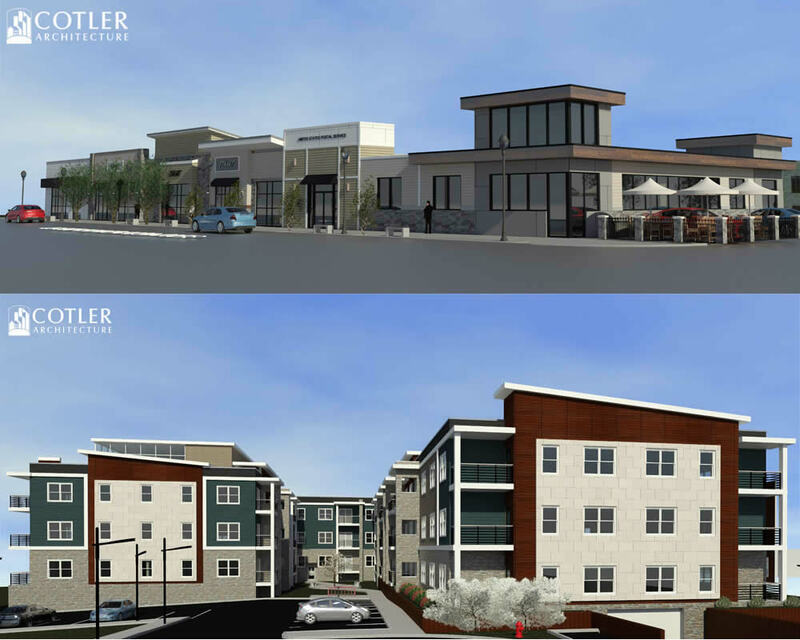 * But the height has still been a point of contention because neighborhood residents already concerned about the impacts of adding 109 units on the site also pointed out that a four-story building would stand out from the mostly 1- and 2- and 2.5-story homes nearby. At Wednesday's meeting, two neighborhood residents again voiced their concerns during the public comment period. Common Council member Judy Doesschate -- who has been a consistent skeptic at earlier meetings -- was not there, but she filed an 8-page document with the BZA detailing her doubts about the project and its qualifications for the variance, citing concerns about the project being too large, too dense, and out of character with the neighborhood. "This building will be an asset to the neighborhood," said real estate agent David Phaff, who's been one of the project's representatives, to the board Wednesday citing new lighting, new sidewalks, and the planned cafe. And of the skepticism to the project: "Anything different in the neighborhood will be considered intrusive." The BZA voted 5-0 to approve to the variance, which is technically what's known as area variance. Afterward board chair Richard Berkley explained the bar for granting an area variance -- which is essentially a request to bend a rule for zoning of an area -- is relatively low. That contrasts to a use variance, which asks for a completely different use from the one specified in the zoning. Berkley said a use variance is almost never granted. "But with area variances, a lot them get granted because there is an explicit balance between the benefit to the proponent of the project and the burden and benefit to the community," he said. 2. Whether the benefit sought by the applicant can be achieved by some method feasible for the applicant to pursue, other than an area variance. 3. Whether the requested area variance is substantial. 4. Whether the proposed variance will have an adverse effect or impact on the physical or environmental conditions in the neighborhood or district. 5. Whether the alleged difficulty was self-created, which consideration shall be relevant to the decision of the BZA but shall not necessarily preclude the granting of the area variance. Berkley gave some examples of some the specifics the board considered for the project. "We asked for the traffic safety office to put something in the record for us because we had some concerns based on what we heard, that perhaps there would be a lot of traffic," he said. "And everybody knows the Playdium hasn't been very active and so we thought it was important to hear about the ability of the infrastructure to handle it. You know the sewer of the water and all that and they've met all those concerns over time." The BZA decision isn't the last hurdle for the Playdium redevelopment project. The planning board has yet to give the OK. Its next meeting is December 21 -- and though the agenda isn't out for it yet, it's a good bet this project will be on it. The proposed New Scotland Village project across from St. Peter's, with a new retail strip (top) and apartment building. in which new residential projects -- both planned and completed -- hold the promise of making the city's built landscape taller and denser. There's also been significant pushback from neighborhood residents to many of these projects. The Playdium project, the proposed New Scotland Village project across St. Peter's Hospital, and the proposed private dorm on Western Ave are just the latest examples. People get concerned when they see change around them and a vote to have [Rezone Albany] go forward was a vote for positive change in the city. And what we've been seeing since the zoning code was passed is a lot of positive change. Now as someone who you know lived half my life in New York City or other large cities. The issue is not density but it's good density versus bad density. So we have a lot of dense buildings for example some of the Ploof properties where you had a building that was built for six floor-through flats and had 26 -- I don't want to call them studios -- but had 26 things in there. And that's bad density. But when you build a new building, you know, with [networking cable] in the walls and with all the modern fire suppression and underground garage and commercial on the bottom and it's a little more dense than what you have around you, which are essentially single family houses that have over time turned into threes or fours -- that's a good density. Because there are certain types of neighborhood amenities and city amenities as a whole that you can't support unless you have sufficient density. Remember that we're almost 30,000 people below the size of what Albany was only a short time ago. And that extra 30,000 people, or even more if we go to some more good density, will bring in more of the walkability and more of the amenities that we all say that we want -- unless we see it happening in our neighborhood. The new zoning code specifies story limits for buildings, not physical heights. So buildings with fewer stories could end up being taller than buildings with more stories depending on floor height. The thinking behind this way of writing the rules was to try to keep developers from squishing (technical term) a bunch of floors into a building to meet height limits. But it also potentially opens the way for buildings to end up being taller than maybe intended. So look for this topic to maybe come up, and be adjusted, when the city reviews Rezone Albany next month. If this city is just going to give out variances, what was the point of are-zone? Those are UGLY FUDGEE buildings!!!! Why isn't any housing developed mandated to include affordable apartment rents? This is pretty standard in most enlightened cities. You know, the Playdium bowling alley didn't "blend in" with the 1-2 story residential buildings in the neighborhood either. Yet somehow we survived. But I'm glad they got the height variance. I'd much rather we build up rather than sprawl out (any more than we already have cough Colonie cough). Sprawl compounds traffic and it's much easier to just build dense the first time. @Carol. Per the new zoning code, new residential projects with 50 or more units have to include at least 5 percent of units set aside at rents deemed affordable according to a formula based on the city's median income. So all of these bigger projects will include affordable units. AOA covered this extensively in May of this year. There is that large, 9-10 story, old brick apartment building on Main, just south of Madison. I'm sure a building like that would not be built in Pine Hills today, but it does provide some perspective. That building does not blend in either, but it adds to density which is what cities are all about. I think the most important question here is how much longer are the Playdium and the Bear's Den going to be open for? I hope they plan to re-purpose the bowling lanes. Those wood floors can be reused for cool projects. I am glad to see the Playdium site plan moving ahead - involved much discussion, input and modifications. And yes to the hope that Playdium floor will be salvaged for reuse! There are many ways to look at the taxes - and I don't think things are too bad in this particular case. Another question to ask is how much services would the new building require from the city. A new, well-maintained building is likely to require less firefighters attention than older ones. I don't know how this would look in terms of criminal statistics - if better than (quite high) Albany average, city can easily end net positive right there due to cost of police not going up too much.